Have you ever wondered how tiny chihuahua can be related to a rottweiler or a pit bull terrier can be similar to a dalmatian? 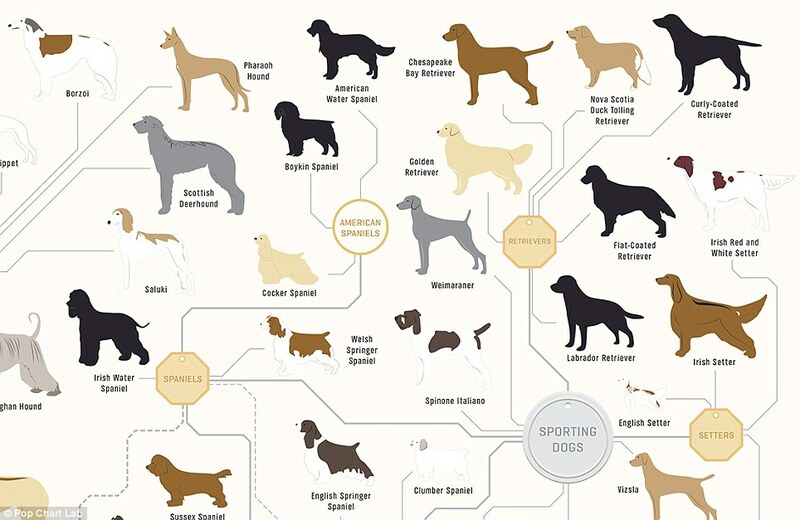 One artist has created a dog family tree that highlights the diversity of dogs and how breeds are interconnected. 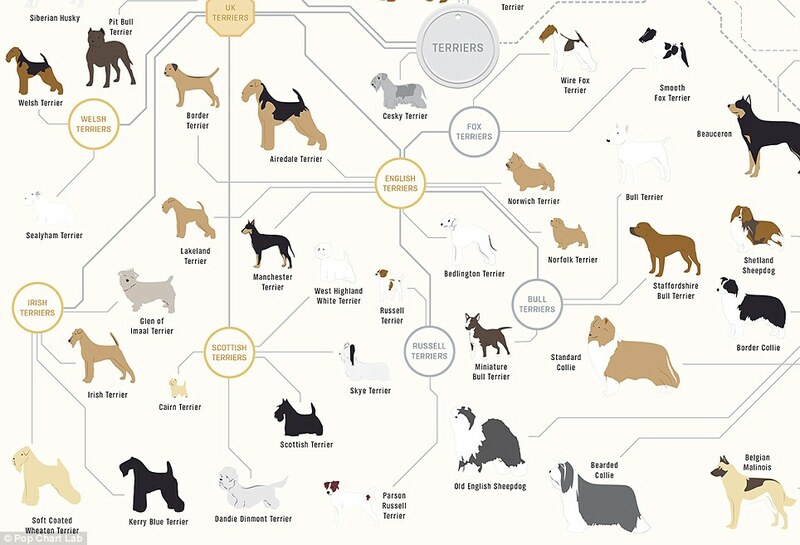 From terriers to toys and mountain dogs to sight hounds, it delineates almost every standard pure-breed dog so you can see how one canine is connected to another. For example, the chart shows that a chihuahua – the smallest breed of dog that heralds from Mexico – can be easily linked to rottweilers, which are popularly known to make good – and sometimes ferocious – guard dogs. 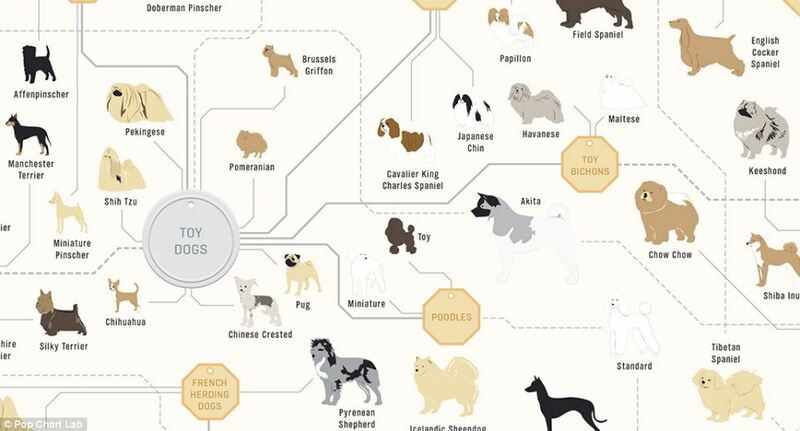 According to the chart, chihuahuas are part of the toy group and are closely related to toy pinchers, which are in turn linked to pinchers and then common guard dogs such as the rotweiller. In the similar way, the giant saint bernard is related to the little pug via the working dogs group, then common guard dogs group, followed by the pincher and toy pincer groups, which then link to the 'toy' dogs of which the pug is a member. It might seem incredible that dogs with such different visible characteristics – from their size to their type of hair – can be so different, but it is because all dogs are members of the same species – Canis lupus familiaris. Their genetic code is relatively simple compared to other species and is therefore easily adaptable as drastic changes - such as the type of hair or ears – is controlled by a single genetic variation. 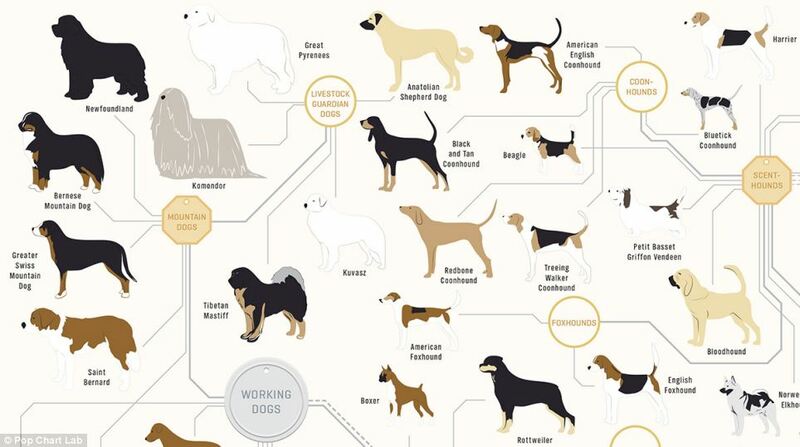 The family tree makes it easy to see which dogs belong to the same ‘family’ groups. For instance, groups of dogs such as setters, pointers, spaniels and retrievers belong to the ‘sporting dogs’ group, as well as individual breeds including the vizsla and wirehaired pointing griffon. Dalmatians are relatively closely related to a number of unlikely breeds. According to the chart, the spotty dogs are closely linked to the diminutive French bulldog and candy-floss like bichon frise. U.S. scientists said that part of the genetic overlap observed between some modern dogs and wolves is the result of interbreeding after dog domestication and not a direct line of descent from one group of wolves. They believe their research reflects a more complicated history than the popular story that early farmers adopted a few docile, friendly wolves that later became our modern canine companions. Instead, the earliest dogs may have first lived among hunter-gatherer societies and adapted to agricultural life later, according to the study. Researchers from the University of Chicago said that dogs are more closely related to each other than to wolves, regardless of geographic origin as they do not descend from a single line of wolves.